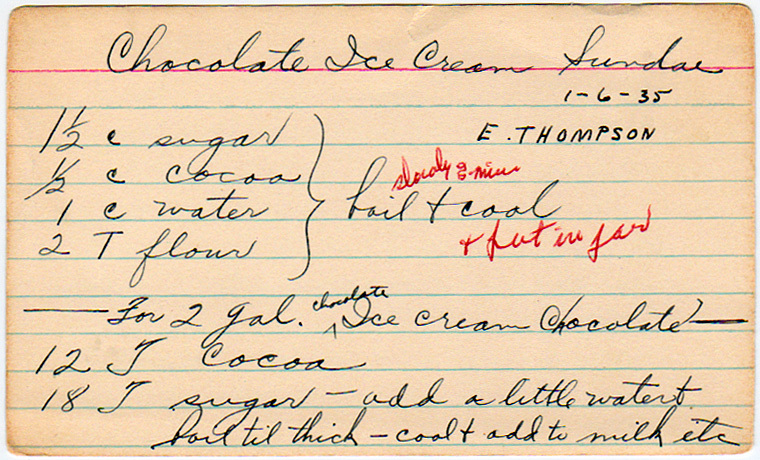 Meanwhile, 78 years ago today, E. Thompson wrote this recipe for chocolate syrup. The ice cream sundae was invented sometime in the late 19th century, though like any 19th century food invention, about six different places claim to have originated it. By about 1900, it was a popular enough confection to be known nationwide. A probably apocryphal explanation for the name is that, along with liquor, some towns banned ice cream sodas on Sunday as being too indulgent for the Sabbath, and this was somehow a more suitable replacement. Add a little water and boil till thick; cool and add to milk, etc.